The game targets WP7 by default but we would like to port to other mobile platforms e.g. iOS / Android. MonoGame implements XNA 4.0 API and can be used to port C#/.NET code: On Windows PC, MonoGame integrates directly in Visual Studio 2012. On Mac OS/X, MonoGame integrates well with Xamarin Studio. This post outlines the main tasks to port Candy Kid to Android platform; the next post will focus on iOS. This post assumes you have the Android SDK installed and C:\Android\sdk\platform-tools\ added to the Windows PC Environment path. Also, all Android devices should be setup for USB Debugging enabled. Download and install MonoGame for Visual Studio. Here is tutorial to create cross platform MonoGame. 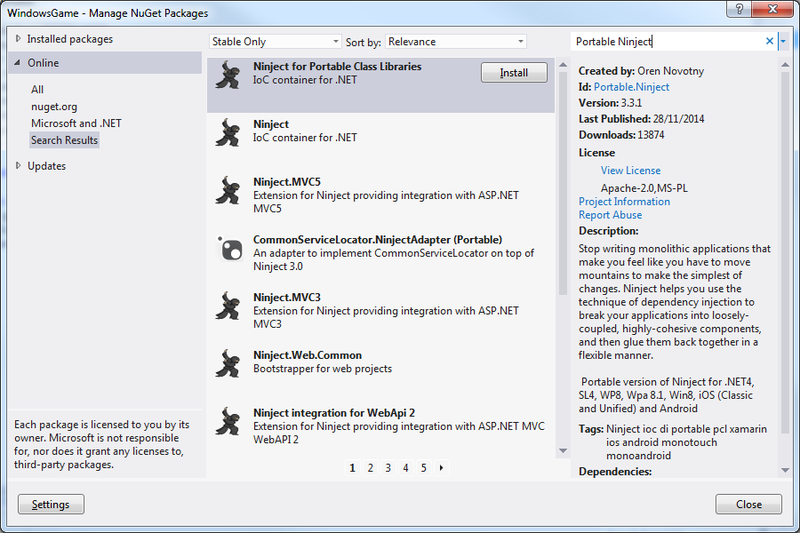 Launch Visual Studio 2012. File | New | Project. Expand Templates | Visual C# | MonoGame. 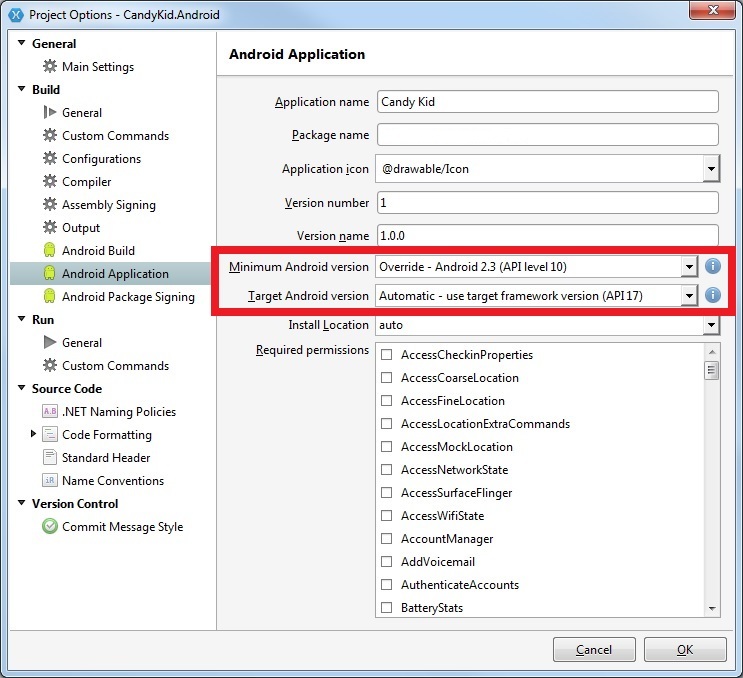 Choose MonoGame Android Project. Name: CandyKid.Android. Choose project Location. OK. Build solution. Error: Your app is too large to be developed with Xamarin Android Starter edition. Choose Begin a Trial from popup. Xamarin then activates the trial version. Rebuild solution fine. 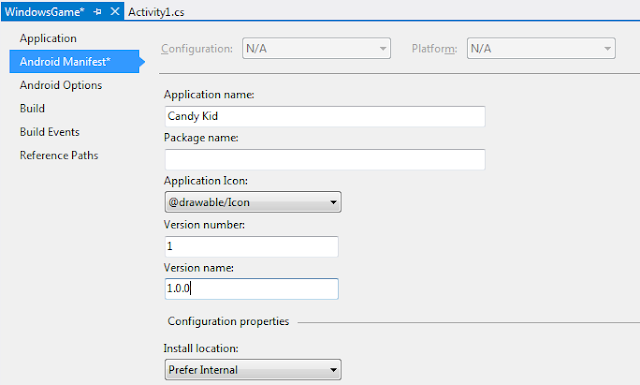 Update Activity attribute: set Label="Candy Kid"
Note: MonoGame Android Project should automatically add reference to System.Xml.Linq by default. 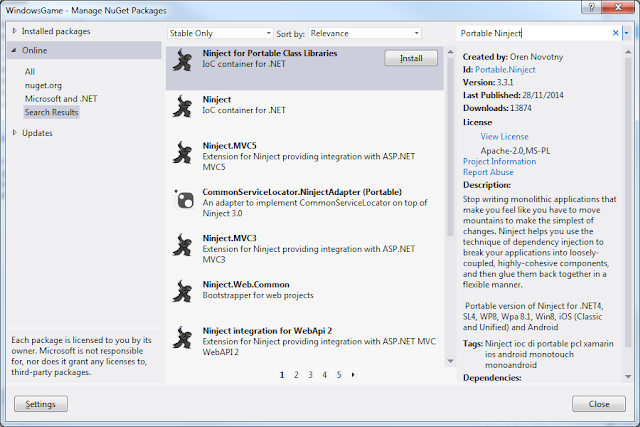 Enter "Portable Ninject" into Search bar top right | Select "Ninject for Portable Class Libraries"
Version number is the Version code on the Google Play Developer console. This value must be unique. Version name is the build version. This value does not need to be unique but it's best practice to do so. Why? Because Version name is visible on the Google Play Store whereas Version code is not (internal). 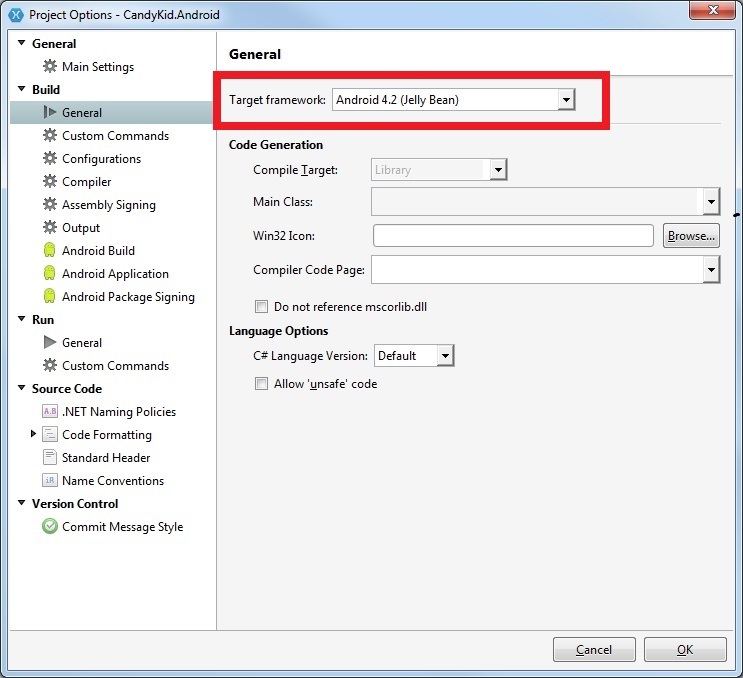 Right click Project | Options | Build section | General | Set Target framework: Android 4.2 (Jelly Bean). At the time of this writing, Android 4.2 (Jelly Bean) is the lowest API version that will build and deploy. Otherwise Android process will not be killed when you close the game and therefore cannot re-launch. Finally, you may like to create a splash screen activity as the main launcher to override default activity. The benefit of this is that as soon as the player taps the game icon, the splash launches immediately. 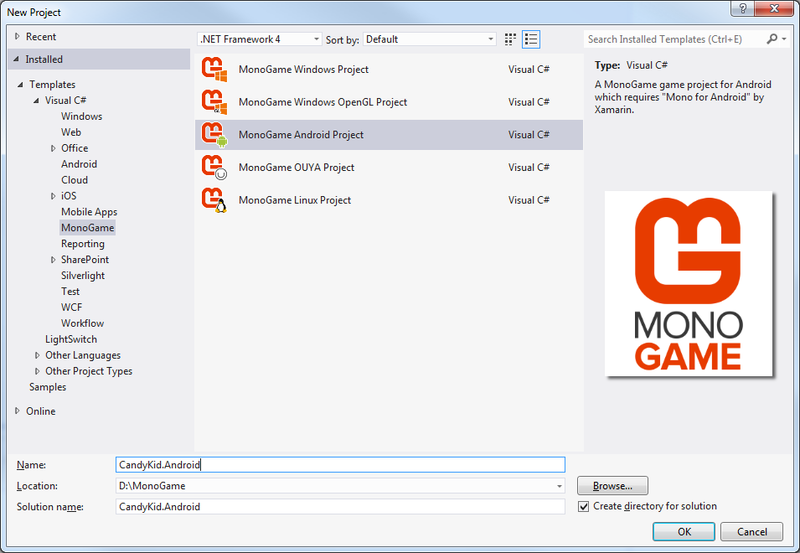 MonoGame Android Project templates add both an "Assets" folder and a "Content" folder by default. Copy output from content pipeline XNB file built from spritefont file in the original XNA game project. Copy source MP3 files for Songs and WAV files for Sound Effects from the original XNA game project. Start | run | Type MonoGame Pipeline. MonoGame Pipeline launches. Choose File | New. Save project. Choose "Copy the file to the directory" | OK. Right click file | Rebuild. XNB file available in bin folder! Attach Android device to Windows PC. Choose Start | Run | cmd. Type "adb devices" shows device listed. In Visual Studio 2012, select Android device from drop down list next to "Play" button. Hit F5 to Start. Start | run | cmd. Navigate to bin / Release folder. Type "adb install Package-Signed.apk" to install. Attach Android device to Mac OS/X. Xamarin Studio, click arrow next to build configuration for device. Click Play button. Android device launches game as "Evaluation Software". Build expires within 24hrs. Alternative: right click CandyKid.Android project | Archive for Publishing. Click Sign + Distribute button. Select Android Distribution Channel as "AdHoc" | Next. Create a New Key or Import an Existing Key. Choose Next to Publish as Ad Hoc. Click Publish button. Choose Location | Save. Enter the key password. Launch terminal window. Navigate to the saved folder. Type "adb install Package-Signed.apk" to install. 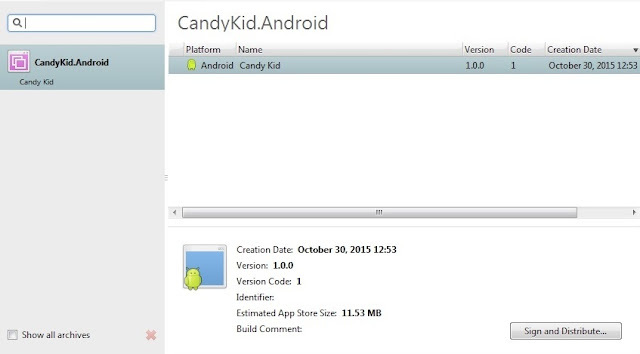 That concludes the Candy Kid port to Android platform. The next post will focus on Candy Kid port to iOS.